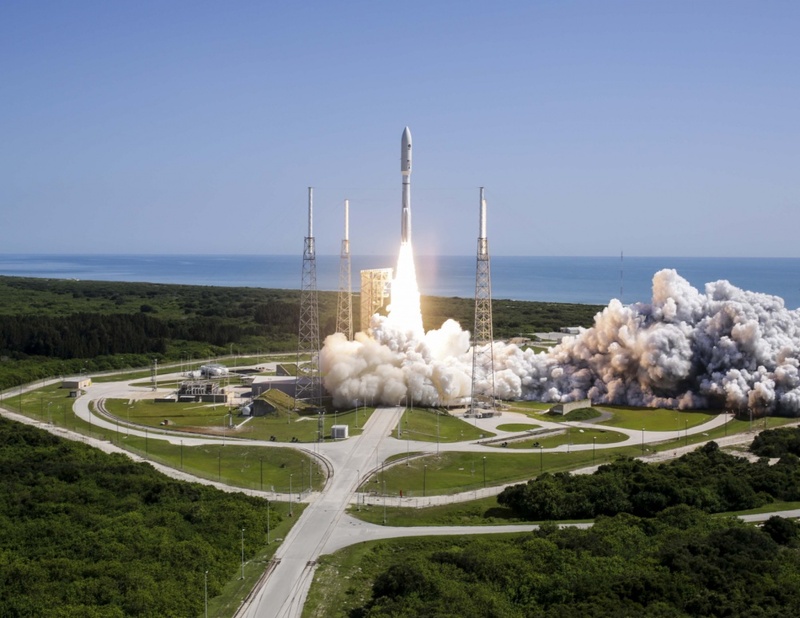 June 24, 2016 – A United Launch Alliance (ULA) Atlas V rocket successfully launched the MUOS-5 satellite for the U.S. Navy. The rocket lifted off from the Space Launch Complex-41 at Cape Canaveral Air Force Station, Florida, June 24 at 8:30 a.m. EDT. Built by Lcckheed Martin, MUOS-5 completes the satellite constellation that will provide a new global military cellular network offering enhanced communications capabilities for mobile forces worldwide. 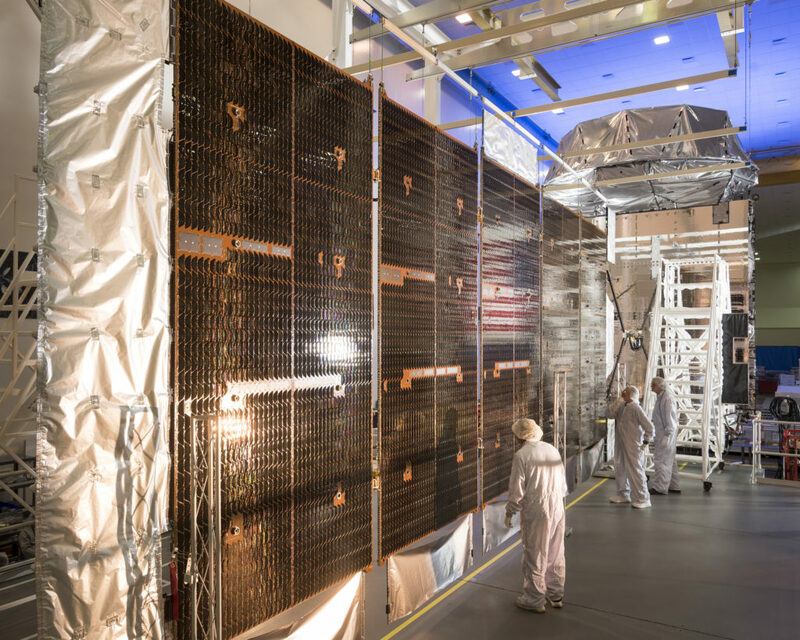 Lockheed Martin assembled and tested all five now-on-orbit MUOS satellites at its Sunnyvale, California, facility. For the Navy, MUOS-5 completes a network of orbiting satellites and relay ground stations that is revolutionizing secure communications for mobile military forces. MUOS’ new smart phone-like capabilities will provide safe and secure communications across the globe, through rough terrain and extended communications reach to the Polar Regions. MUOS’ capabilities include simultaneous, crystal-clear voice, video and mission data over a secure high-speed Internet Protocol-based system. Once fully operational, the MUOS network will provide users with 16 times more communication capacity than the legacy system it will eventually replace. More than 55,000 currently fielded radio terminals can be upgraded to be MUOS-compatible, with many of them requiring just a software upgrade. A Lockheed Martin-led team, stationed at Naval Base Ventura County, Point Mugu, California, is operating the satellite from its transfer orbit to its test slot. Over the next few days, MUOS-5 will transition to reach its geosynchronous orbit location approximately 22,000 miles (37,586 km) above the Earth. The satellite’s solar arrays and antennas will then be deployed, and on-orbit testing will start for subsequent turn-over to the Navy for testing and commissioning to serving. Lockheed Martin invited six students to watch the MUOS-5 launch. Earlier this year, the students competed in the FIRST Robotics Competition and the FIRST Tech Challenge and were Dean’s List winners from each of the three Florida FIRST championship events. The students met Lockheed Martin’s launch team, where they showcased their robots and later attended a photo opportunity to see the Atlas V rocket up close before the launch. Mounted aboard a United Launch Alliance Atlas V rocket standing 206 feet tall, the 15,000 pound MUOS-5 payload was launched with over two-and-a-half million pounds of thrust on the way to its final location above the Indian Ocean. The mission was ULA’s fifth launch in 2016 and 108th launch since the company formed in 2006. MUOS-5 was the seventh mission to be launched aboard an Atlas V Evolved Expendable Vehicle (EELV) 551 configuration, which includes a 5-meter diameter payload fairing and five solid rocket boosters. The other missions launched in this powerful configuration include the four previous MUOS missions, as well as the New Horizons mission to Pluto and the Juno mission to Jupiter. The Atlas booster for this mission was powered by the RD AMBROSS RD-180 engine and the Centaur upper stage was powered by the Aerojet Rocketdyne RL10C-1 engine. ULA’s next launch is the Atlas V NROL-61 mission for the National Reconnaissance Office, scheduled for July 28 from Space Launch Complex-41 at Cape Canaveral Air Force Station, Florida.